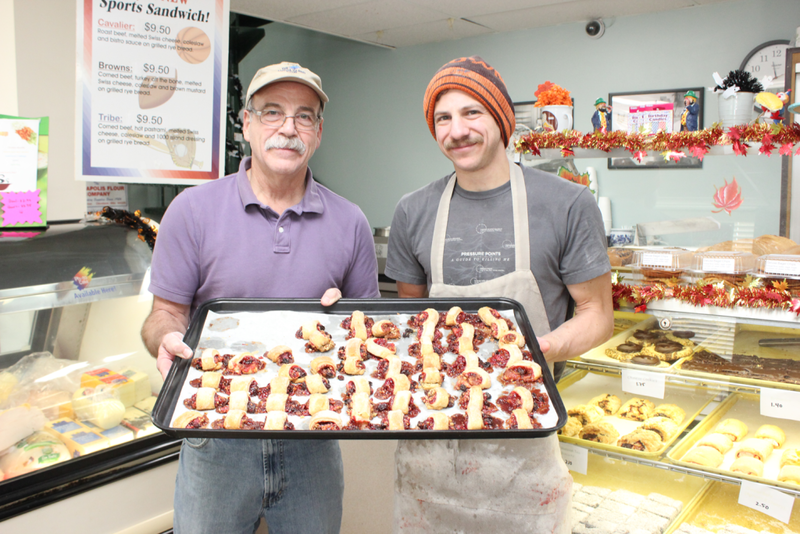 Joel Davis and his son, Stuart, present a recently cooled pan of rugelach in the storefront area of Davis Bakery’s Warrensville Heights location. Davis Bakery has been in Joel Davis’ family for 79 years, and for him, baking – especially pastries such as rugelach – is a family affair that brings back memories of holidays past. Davis is part of the second generation of Davis Bakery. He started helping when he was 8, and he’s now been with the company for 39 years. 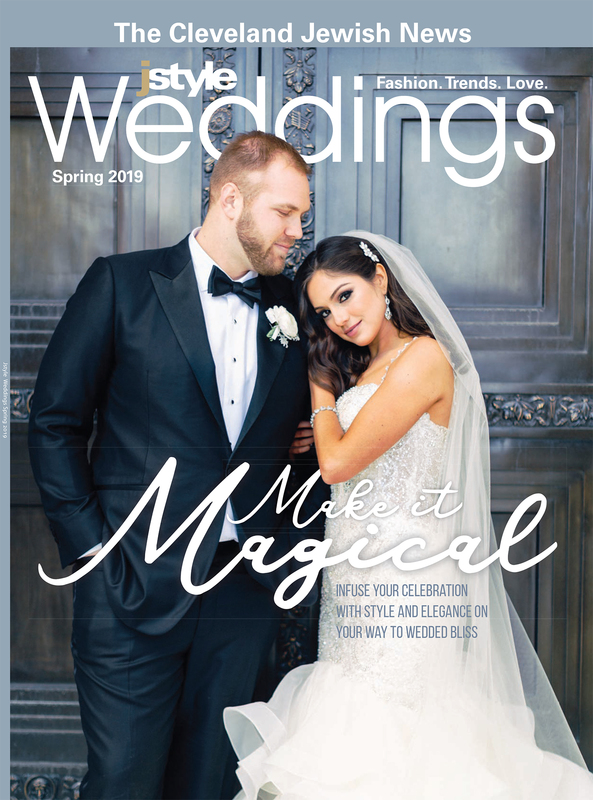 His two sons – Stuart and Jayson, the third generation – both work at the bakery, and there’s even a fourth generation working there: Davis’ great-nephew, Matt Martin, who works in the office. 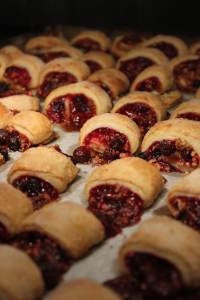 Davis Bakery, with locations in Warrensville Heights and Woodmere, offers rugelach in both raspberry and chocolate flavors, both with walnuts mixed into the filling. The chocolate rugelach also has mini-chocolate chips adorning the top of the pastry. Davis says both sell well, particularly around Chanukah, though the raspberry version is slightly more popular than the chocolate. Inside Davis Bakery’s Warrensville Heights location, several bakers work on rugelach at one time, all handling different stages of the pastry-making process. Bakers pull the chilled rugelach dough out of their fridge and spread it out across a table covered in flour, to keep the dough from sticking to the stainless steel. They run the dough through a flattener, then cut it into long, thin strips before brushing off the excess flour. 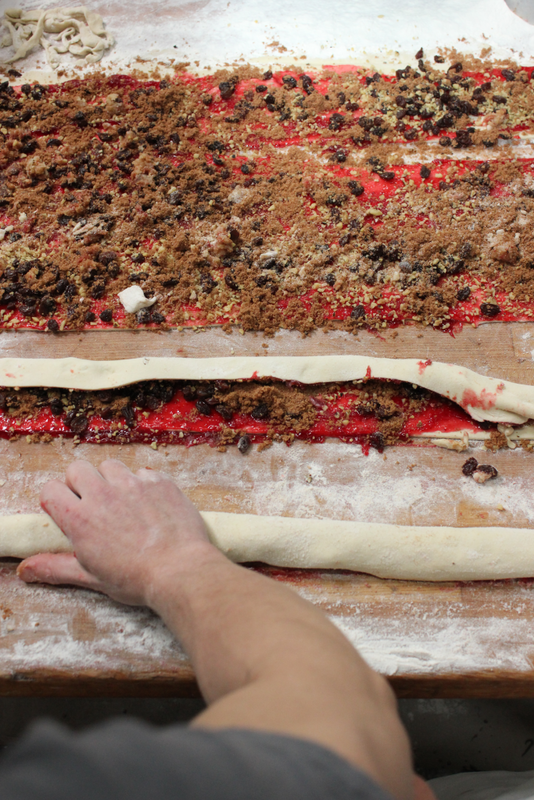 Stuart Davis rolls dough and fillings into the familiar shape of rugelach. At another table, bakers add filling – in this case, raspberry – by spreading it across the dough. Next, walnuts are added, along with raisins, sugar and a couple of other Davis Bakery secret ingredients. 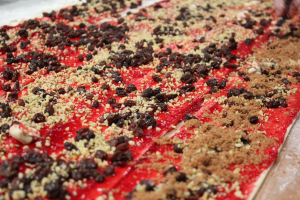 Those long strips of dough and filling are then rolled up into the recognizable shape of rugelach and eventually cut into small, bite-size pieces. Those pieces are put on sheet trays and then inserted into the three large rack ovens to bake. At the Warrensville Heights location, they can typically fit 160 lbs. of rugelach in a single oven. That’s 40 sheet trays, each with about 4 lbs. of rugelach. The No. 1 item Davis Bakery ships is coconut bars, something Davis says is “unique to Cleveland,” but the bakery makes approximately 15,000 pounds of rugelach each year. On top of that, Davis says rugelach is one of the items he bakes that he never gets tired of eating. He says the bakery makes holiday trays for local corporate clients, including one loyal bakery customer who sends out more than 100 pastry trays each holiday season to those who have referred clients to him. “We’ve been doing his trays for over 40 years,” Davis says. The baking process is a bit of a balancing act at Davis Bakery. Some items, such as rugelach, can be made ahead of time and then placed in the freezer prior to baking, but with a lot of items, such as bread, Davis’ bakers don’t have that luxury. With the holidays approaching, Davis said in early November they’re doing their best to prepare for the impending crush of orders. For as busy as Davis Bakery gets around Chanukah time, he says it’s not quite as crazy as during Rosh Hashanah. Joel Davis, understandably, doesn’t easily part with the Davis Bakery recipe for rugelach. However, he mined a trusted Jewish cookbook to provide this recipe, which he says is similar to the one his family has been using for generations. 1) In a mixing bowl, combine the cream cheese, butter, salt (plus shortening, if desired) and use the flat (paddle) beater at medium low speed to blend until uniform, 2 to 3 minutes. 2) Reduce the mixer to low speed and gradually add the flour, mixing only until a soft, sticky dough is formed, 2 to 3 minutes. Form the dough into a ball, wrap in plastic and refrigerate for 2 to 3 hours to chill. 3) Place the chilled dough onto a lightly floured work surface and roll it out into a sheet about 16 x 10 inches. Carefully fold it in thirds, brushing away any excess flour. Scrape the work surface clean to remove any dough sticking to it and lightly re-flour. 4) Turn the dough upside down so that the bottom is now facing up and rotate it 90 degrees. Repeat the previous step, rolling it into a 16 x 10-inch sheet, dusting with flour as necessary to prevent sticking, and folding it into thirds. Wrap the dough in plastic and refrigerate overnight. 5) Remove the dough from the refrigerator, cut it into desired length and add the raspberry filling and walnuts as desired (Davis says you should not be able to see the dough underneath the filling), roll it up, and wash it with either butter or eggs (Davis Bakery uses butter). 6) Place the unbaked pastry in the oven at either 350 or 360 degrees, depending on your oven and how thick you rolled your pastry, for between 12 to 17 minutes. (The time will depend on how you rolled the pastry up, thicker will take longer than thinner.) Let cool and enjoy.